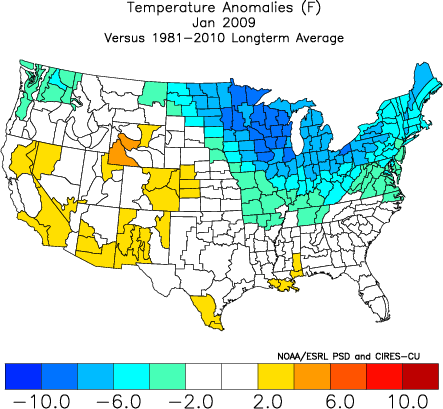 As we approach the end of 2013, we close the books on a very wintry month of December for both the NYC metro area and the United States as a whole. From record lows across the Rockies, Plains, and Mid-west, frequent snow/ice events for the Northeast, a recent major ice storm for Northern New England, to record high temperatures yesterday over the region, this month has produced some wild swings in weather. Extreme temperature shifts were liable to occur this winter due to the presence of a negative EPO, blocking ridge in the North Pacific constantly combating an unfavorable positive NAO signal in the north Atlantic. The result has been a robust SE ridge, though the arctic air has been pressing quite fiercely on the NW fringes of this SE ridge. For our region, our location along the baroclinic zone / thermal gradient has yielded some minor to moderate snows for winter 2013-14 thus far, giving us above normal snowfall for December 2013. Some of the analogs previously examined for the winter outlook, like 2008, have been working well in terms of the overall 500mb pattern, although this month actually finished snowier than December 2008 for most. This is not a surprise since analog years won’t be able to tell us where the heaviest snow will fall, but they are helpful for clues for the mid level pattern that produces said wintry events. Going forward, the pattern turns colder over the coming days, with an outside chance of a white Christmas for a low percentage of our area. A quick moving but fairly potent mid level wave will be propagating through the area tomorrow, and this could ignite some stronger snow showers in association with the zone of upward motion/convergence at 700-800mb. For most, it’ll bring about some “mood” flakes as a nice reminded that winter is still alive and kicking. Dry weather prevails through late week, then things begin to get more interesting as we approach the New Year and beyond. The negative EPO, North Pacific ridge that provided us with the cold/snowy mid December briefly broke down over the past week (and we can see the result with very warm, rainy conditions) will be returning over the coming week. This NPAC mid level ridge has been a very stable feature over the past couple months and continues to be crucial in combatting the poor north atlantic / +NAO signal. However, the Arctic pattern could be changing over the next couple weeks, and this could make for a somewhat different evolution for January. Thus far, we’ve seen a strongly positive AO (low height field in the Arctic) which correlates to a stout SE ridge near the East Coast. That signal in conjunction with the +NAO has prevented the core of the cold anomalies from reaching the East Coast so far this winter. The AO is progged to turn negative, meaning increased blockiness across the north pole. In fact the ridge over northern Russia may connect with the NPAC ridge, providing a funneling mechanism for arctic air from Siberia into North America. The regime so far without any AO blocking has produced serious cold over the Rockies/Plains. When we combine the negative AO with the negative EPO, we arrive at a pattern which has the potential to produce major cold even across the Lakes and Northeast. 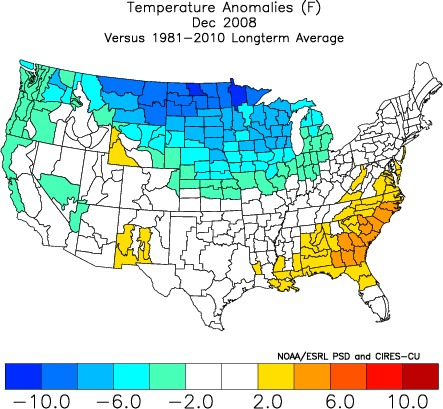 Some of the analogs that are popping up for the coming weeks include 2009, 1994, among many other years in the 60s and 80s which featured a cold pattern for January. The NAO is less than stellar, but the negative AO and EPO should be sufficient in terms of amplifying the trough into the Central / Eastern US. The NAO will still promote some resistance along the east coast, but the baroclinic zone should be further SE than we’ve seen. In other words the zone of winter events should also press further SE. 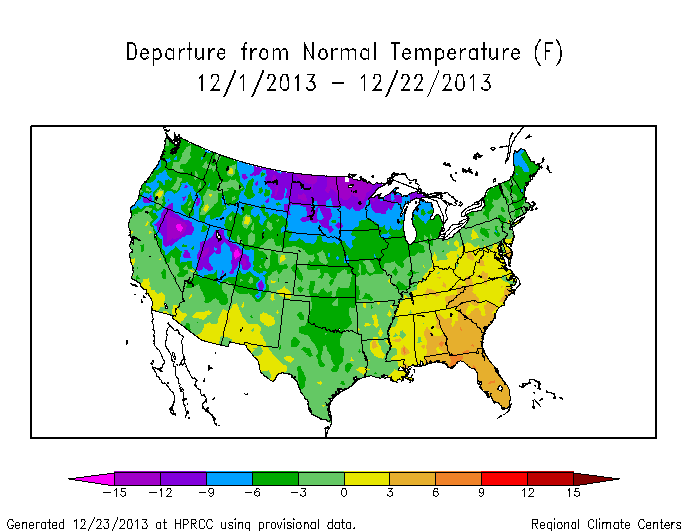 Rolled forward into January 2009, here’s what the temperature profile looked like. Cold into the Lakes and Northeast but not for the Southeast. The lack of strong negative NAO will mean the SE ridge will occasionally exert itself up into our area. The total analog package for the beginning of 2014 has the following depiction. Note the burgeoning mid level ridge from the NPAC into the Arctic, and the corresponding downstream trough over the East. Overall, analogs, pattern progression and persistence for the winter thus far argue strongly for the redevelopment of the negative EPO feature. These higher heights are also progged to spill into the Western US, bolstering the PNA values at least for a time. This will help to shift the mean trough axis from the Central US (where it was located in December 2013) further east. 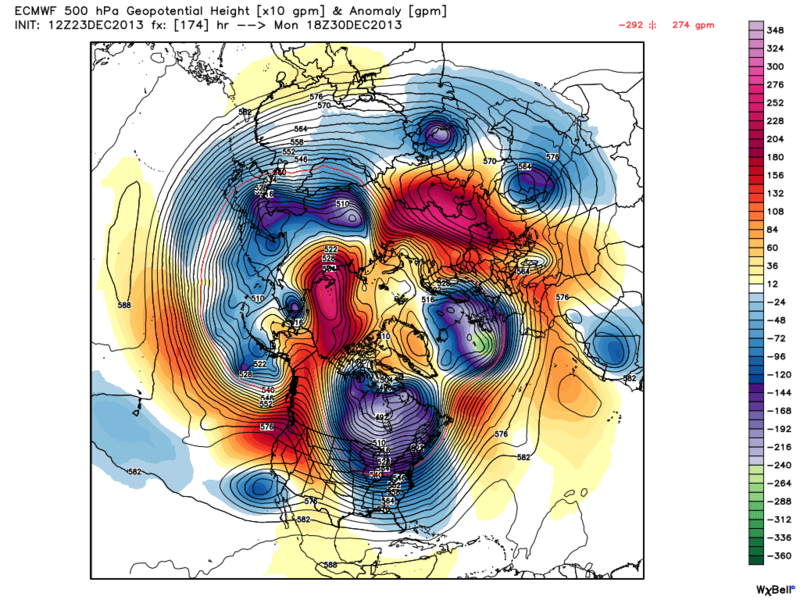 The question becomes: how much Arctic blocking can we get, and will it spill over into the NAO domain? It’s likely we see the AO fall to neutral or slightly negative, but a strongly negative AO seems unlikely right now. Stratospheric conditions remain quite cold with a strong vortex up in the upper troposphere. This suggests the AO (which is calculated lower in the troposphere) will have a difficult time falling much lower than slightly negative. The NAO pattern looks to neutralize but a major Greenland/west based block also seems unlikely at this juncture. One might say, well doesn’t that mean our cold/snow chances are off the table? Far from it. 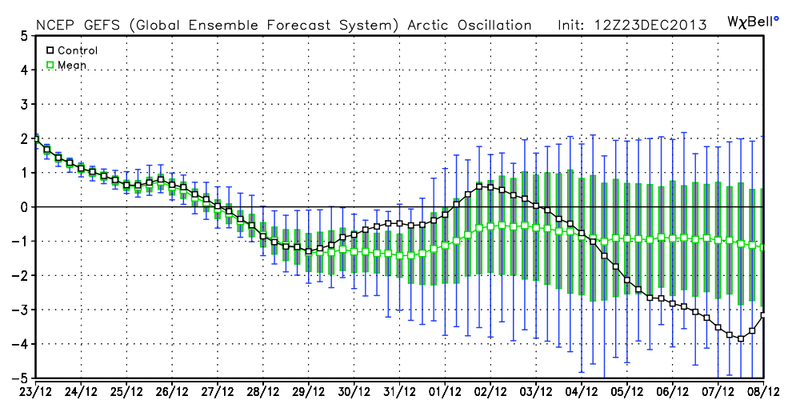 The NAO isn’t everything, as we’ve seen from numerous cold analog months featuring a negative EPO and AO. The unfavorable Atlantic might even help us by forcing short waves to take a more coastal track rather than far offshore, like we’d probably see in a -AO,-NAO,-EPO pattern. Nonetheless, the individual storm threats will be discussed as they arise over the coming weeks. For now, it looks like an interesting pattern may unfold through the first half of January as blocking prospects improve and the mean trough shifts east.